BDUB'S Blog: Life After the B.O.E. Quite possibly the most amazing blog / memoir of working in Japan as a JET has to be David Namisato's blog, Life After the B.O.E. (www.lifeaftertheboe.com) David was a CIR (Coordinator for International Relations) from 2002 to 2004, and his monthly art work absolutely hits the nail on the head in summarizing the crazy experience that is living over here as a JET. B.O.E. stands for Board of Education, and is the contracting organization, or boss, of all the JETs here. David posts a new art piece every month, and has been doing so since March of 2006, so there are tons of images, but I wanted to share a couple of my favorites that I laughed out loud hard after reading. It might be that you have to experience them to actually find them funny, so I will try to add a little commentary on how it parallels my actual life here. It only takes about one week of class to realize your position here is much more like a court jester than language instructor. Students could care less about English and have a zero attention span, and it's the JET's job to get them motivated to learn. 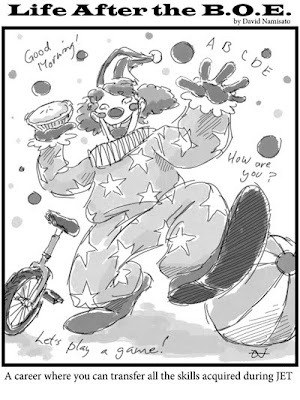 Some days my routine at the beginning of class is nothing short of a clown show - running around the classroom with this ridiculously huge smile on my face, using way over exaggerated body movements, yelling at the top of my lungs "HOWDY PARTNER!! ", "HOW ARE YOU TODAY!?!? ", and "IT'S ENGLISH FUN GAME TIME!!!" I don't think you ever had to live in Japan to relate to this. If you have spent five minutes here you know exactly what I am talking about. Saying any word in Japanese, even こんにちは (konnichiha, good afternoon), or using chopsticks, garners shock and amazement. A resounding ええええええ!!! (eeehhhhhhhhh!!!) follows immediately. 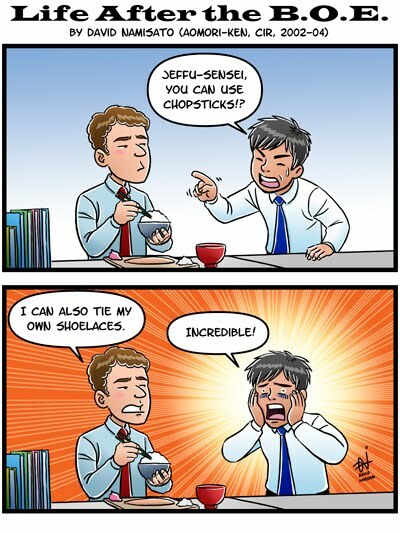 My Japanese co-workers know that I am of at least average intelligence, and that I was an engineer before coming here, but that doesn't stop them from being utterly amazed at anything I do, no matter how small - that I play basketball, like pizza, eat sushi or can drive. This comic, whose title, 日本の夏, translates to "Summer in Japan," is the most true thing you will ever hear about summer here. 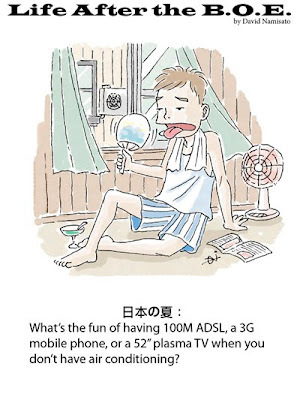 I would trade my cell phone and any other advanced technology that Japan has for AC in the summer and heat in the winter any day. August and September here were atrocious. The heat and humidity were unbearable and nobody has AC, including my school, my apartment and nearby restaurants and stores. Winter is no better, as my apartment has found a way to be colder inside than it actually is outside. We opened the windows when it was 30 F degrees outside to let the warm air in. I could keep going with another 10 more, but will restrain myself. Hopefully I can follow up with another couple in a new post within a month or two!